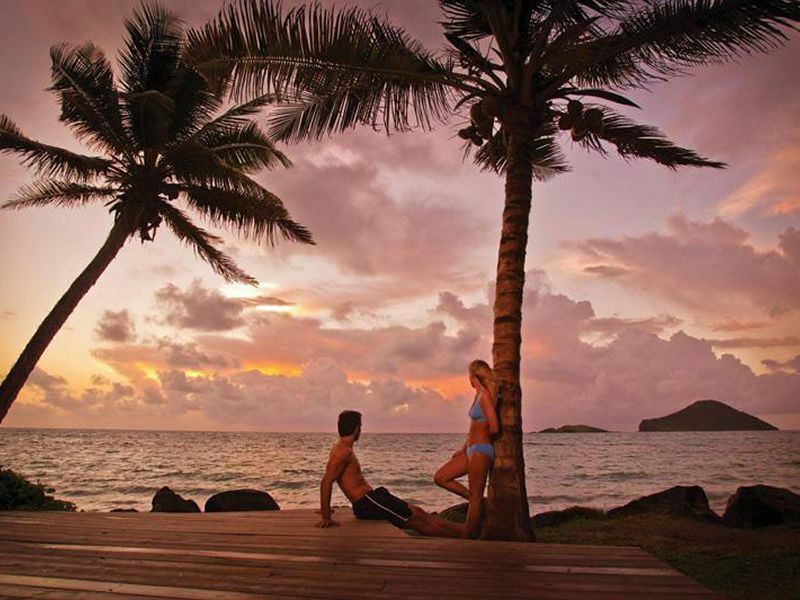 For dewy-eyed newlyweds, the teardrop-shaped island of St Lucia wows with glittering beaches, crystalline waters, sugar-loaf peaks, lush emerald jungles, and a unique mix of laid-back Caribbean charm and French finesse. We check into 10 of the best resorts for kicking off your happy-ever-after. 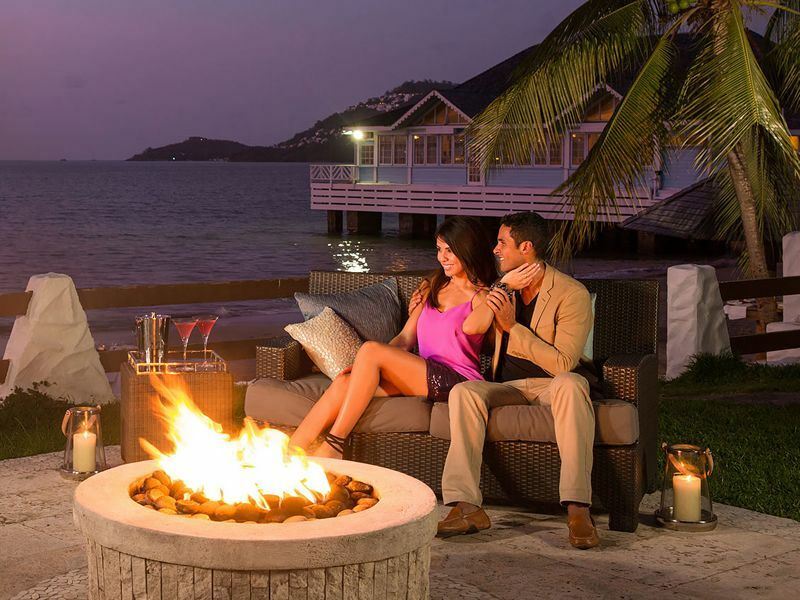 The scene: Assuring affordable chic on the shores of Choc Bay overlooking the fabled Caribbean Sea, this 4-star All-Inclusive resort is just minutes from Rodney Bay Marina and within easy distance of island capital Castries. The sleep: Each of the 335 spacious rooms and suites is finished to a high spec; think all-white décor, lovely bathrooms, private balconies or terraces for day-to-night lounging, and plenty of home-from-home comforts. For added luxury and dazzling sea views you’ll want to spend all day gazing at, book the adults-only Deluxe Ocean View Room. The stay: Whilst low-key in terms of clichéd lovey-dovey trimmings and trappings, it’s bang on-point if you and your other half fancy getting stuck into aerobics and pilates classes, water skiing, paddle boarding, aqua cycling, kayaking, and snorkelling. There’s also a superb outdoor pool, fully-equipped gym, four bars, and six unique restaurants including Le Jardin - a stylish dining spot serving bistro fare worth paying a supplement for. Equally tempting is the Tranquility Body & Soul Spa - a sea-facing sanctuary offering feel-fabulous treatments such as aromatic salt glow scrubs, detox seaweed wraps, deep-cleaning facials, and aromatherapy massages. The setting: It’s all coconut palms, sugar-white sands, landscaped grounds and together time at this 4-star All-Inclusive sleep on St Lucia’s Atlantic-facing southern shore. You’ll be a five-minute drive from Hewanorra International Airport and around 90 minutes from Castries. The sleep: The eye-poppingly perfect adults-only Harmony wing lays on the frills for loved-up couples by way of lounges with loveseats, oversized four-poster beds, marble bathrooms, and private balconies with sea or garden views. Additional mood-setting luxuries in some rooms include minibars stocked with your own choice of wine, and champagne at turndown. The stay: If you’re escaping kids - yours or anyone else’s - the new Oasis area has a palm-shaded pool and bar, intimate cabana beds, hammocks for cosying up in, and long stretches of pristine white sand. There’s also a dawn-to-dusk activity schedule, state-of-the-art gym, three pools plus huge waterpark, and knockout selection of bars for all-day cocktails. Also noteworthy are the six signature restaurants and the Mer Spa - a soothing sanctuary kitted out with two saunas, two steam rooms, relaxation lounge, atrium garden, full-service beauty salon, and eight treatment rooms for all sorts of rejuvenating therapies. The setting: For heart-stopping beach views, this All-Inclusive resort just outside Castries overlooks pristine powder-soft sands. Best of all it’s for couples-only, making it the perfect set-up for honeymoon bliss. The sleep: Whilst each of the 170 luxury-led rooms lure with chic décor, private balconies or terraces and great-looking bathrooms, the Love Nest Suites are a real game-changer. Book the splurge-worthy Beachfront Romeo & Juliet Walkout Butler Room for a huge four-poster bed dressed with luxe linens, and your own personal butler who will cater to your every whim. The stay: Complete with six gourmet restaurants, two outdoor pools with swim-up bars, three whirlpools and a heavenly Red Lane® Spa for all sorts of beauty rituals, it’s no wonder that most newlyweds remain holed up here for their entire honeymoon. There’s also a fully-equipped gym, seven bars for all-day cocktails and nightly entertainment, and unlimited land and watersports including snorkelling and scuba diving. Green fees and transfers to the 9-hole course at Sandals Regency La Toc Golf Resort & Spa are complimentary for those who fancy fun on the fairways. 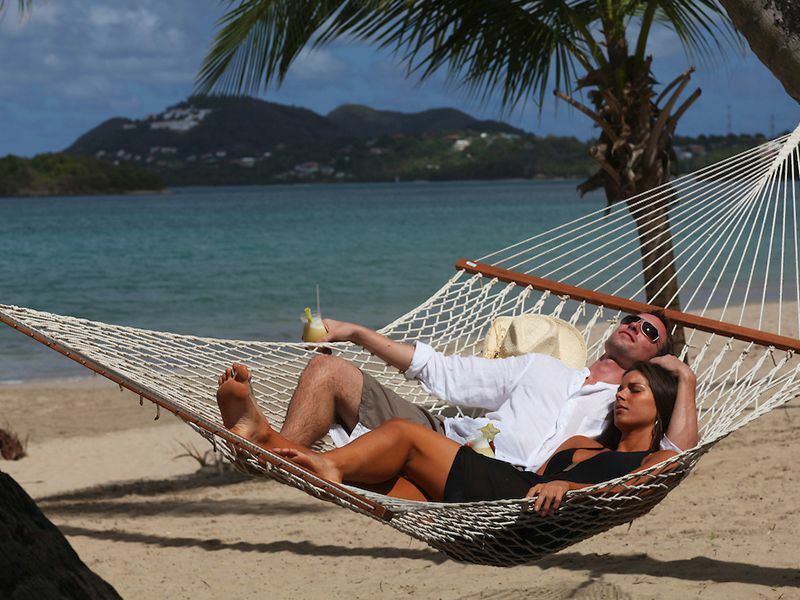 The setting: For understated elegance and utter tranquility in 12 acres of tropical gardens overlooking Labrelotte Bay on St Lucia’s northwest coast, this All-Inclusive 4-star resort is a 10-minute drive from Rodney Bay Marina. Most irresistible here is the laid-back vibe; perfect for those seeking a post-wedding getaway that’s all about checking in and chilling out. The sleep: Each of the 30 boutique-style cottages scattered around the lush gardens assure tasteful Caribbean-inspired décor; expect lots of dark woods, colourful soft furnishings, king-sized beds, and pretty mosaic-tiled bathrooms. For more of a luxury kick, the Deluxe Cottages have stone-built sunken showers extending into private gardens and covered terraces. The stay: Couples who want to do little more than stroll hand-in-hand around the grounds at sunset, relax by the outdoor pool, and linger over gourmet-style meals paired with fine wines and champagne will end up never wanting to leave. There’s also a great lounge for live jazz, cocktails and board games, as well as the option to take guided walks in the resort’s enchanting gardens and enjoy top-to-toe pampering in the open-air Spa Pavilion. The setting: Set at the northern end of the island overlooking the white sands of Cariblue Beach, it’s all pretty secluded at a 5-star All-Inclusive resort that delivers on its promise: ‘Give us your body for a week and we'll give you back your mind’. The sleep: All 155 rooms and suites come with hardwood furniture, turquoise accents, four-poster or king-size beds, and great bathrooms with showers or tubs. Honeymooners can look forward to breakfast on the private balcony or terrace on their first morning, and enjoy appetisers and sparkling wine delivered at sunset on one evening of choice. The stay: There are fewer stylish stays that pile on so many complimentary holistic, sporty and romantic activities in the All-Inclusive rate; everything from a daily spa treatment to a weekly sunset cruise. But while the fitness-related facilities, classes and watersports are all very impressive, it’s the award-winning Wellness Centre that’s the obvious draw. 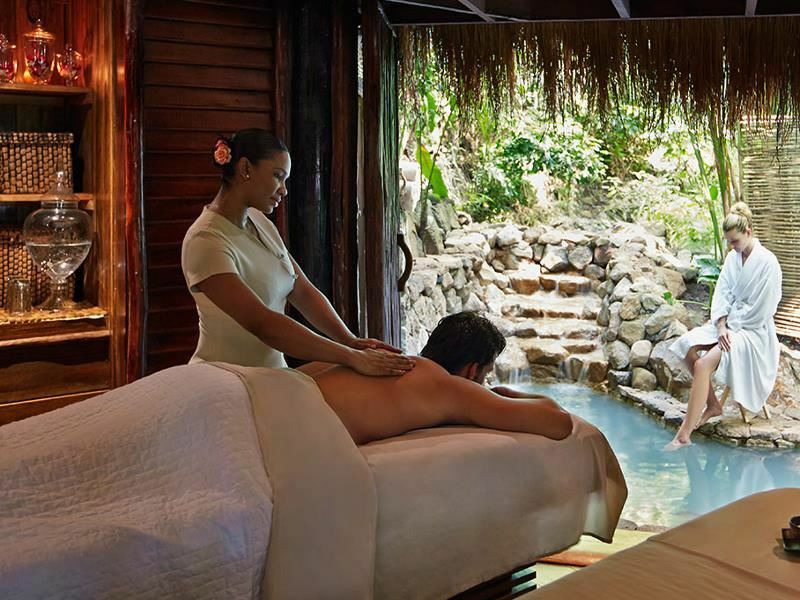 As one of the finest in the Caribbean, it has an Ayurvedic Centre for massages, Skin Care Clinic, and 47 treatment rooms. Further resort highlights include a two-level, infinity-edge pool with raised underwater seating, three restaurants for super-healthy cuisine, and a piano bar for end-of-day relaxing. 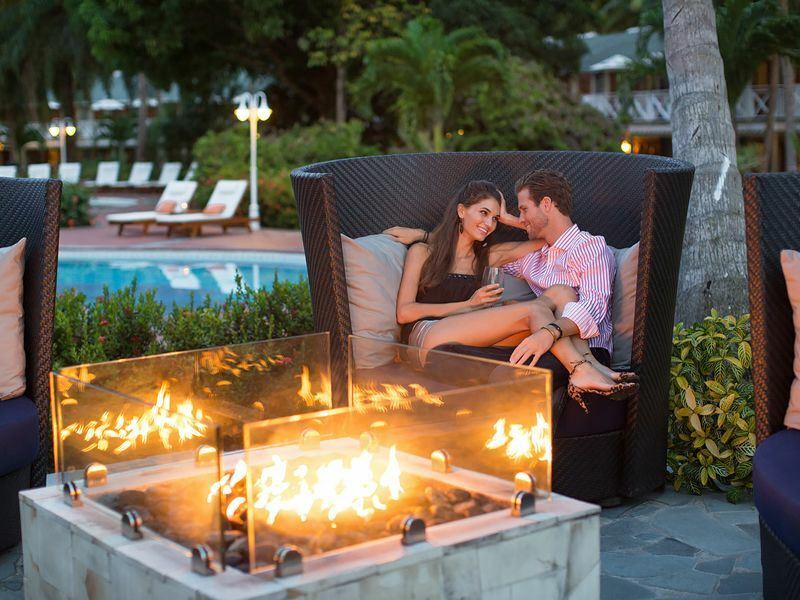 The setting: For a 5-star boutique stay in lush landscaped gardens within the swanky Cap Estate - a former 1,500 acre sugar plantation just a 10-minute drive from Rodney Bay - this intimate resort is just steps from Smugglers Cove in St Lucia’s far north. The sleep: Set atop a private oceanfront bluff for cracking views of the Caribbean Sea, each of the 49 rooms is individually-styled. For blow-the-budget decadence, the Oceanview Villa Suites with living/dining areas, kitchens, and bathrooms with deep-soaking tubs are arguably the loveliest - especially those that have secluded rooftop terraces and private pools. The stay: Loved-up honeymooners can expect a complimentary bottle of bubbly on arrival. There’s also a two-tiered pool, two restaurants for West Indian specialties and contemporary British cuisine, and a cool Champagne Zip-Line to deliver drinks. Further treats include cookery lessons, wine-tasting sessions in the vaulted wine cellar, and the option of booking private champagne breakfasts, candlelit romantic dinners for two on the beachfront, and couples’ massages in the award-winning spa. 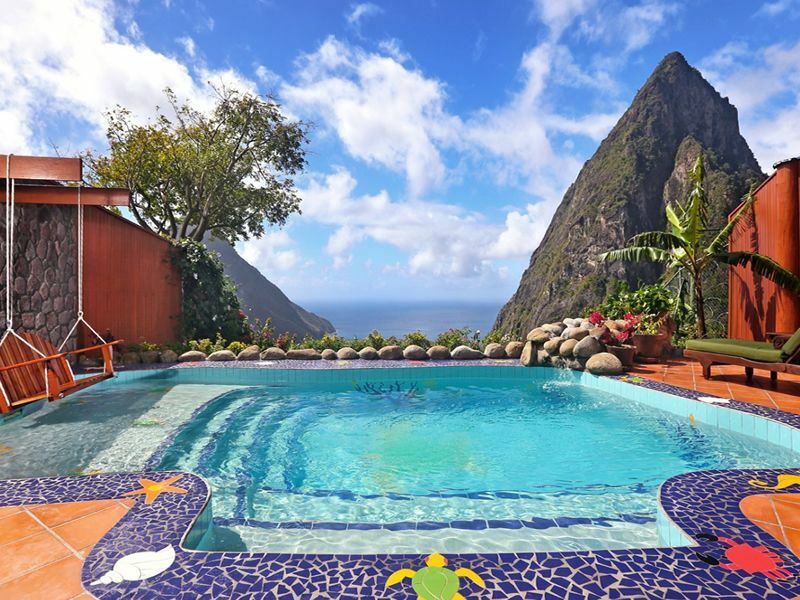 The setting: With dramatic views across the Gros and Petit Piton, this exclusive 5-star adults-only retreat is set on a hillside in the south of the island. Only a 40-minute drive from Hewanorra International Airport, it’s likely that once you’ve checked in you’ll never want to leave. The sleep: The pièce de résistance in the 32 suites is the much-hyped ‘missing’ wall - the result of a once-radical idea that leaves the fourth wall intentionally open to maximise off-the-scale vistas of the Pitons. Private plunge pools, outdoor showers, well-sized four posters, and a complimentary Ladera's Necessaire Kit complete with binoculars, eye masks, slippers and star chart for nightly sky-gazing wrap things up nicely. The stay: With views that are sublime from just about everywhere, there are fewer places dreamier for wide-eyed honeymooners. There’s a lovely spa, fully-equipped gym, dining at award-winning Dasheene, and round-the-clock activity schedule for those who fancy cocktail-making classes, chef’s cooking demos, horse riding and glass-bottom boat tours. Whilst the resort doesn’t have its own private beach, it lays on a complimentary shuttle service to take guests to the sparkling white sands at Sugar Beach. The setting: What was once a sugarcane plantation on St Lucia’s dramatic west coast is now a sure-fire hit for honeymooners seeking 5-star luxury in a drop-dead-gorgeous beachfront setting between St Lucia's iconic Pitons. You can choose your own board basis; everything from room-only to All-Inclusive is available. The sleep: Defined by neo-colonial design elements, sleek furnishings and lots of dazzling all-white décor, each of 79 rooms assures breathtaking sea views. The sumptuous Luxury Villas have high beamed ceilings, four-poster beds draped with voiles and Egyptian cotton, private terraces, walled gardens, and plunge pools. Nice extras include large bathrooms with walk-in showers, and your own private butler. The stay: Following a £65 million revamp, this 100-acre estate offers next-level facilities; think glossy bars, upscale restaurants, scheduled yoga classes, and a top-notch selection of watersports including windsurfing, kayaking and sailing. There’s also a state-of-the-art gym, dive centre, two floodlit tennis courts, and very cool-looking spa with treatments rooms in tree houses above the forest floor. But the real winner here is the beach; a spectacular stretch of sugar-white sands right between the Pitons. The setting: For grown-up glamour with views that look out across the sea towards the island’s Petit and Gros Piton Mountains, this high-end resort set on the hillside above Anse Chastanet is 5-star worthy for newly-weds and otherworldly for design-lovers. The sleep: Rather than just rooms, each of the 24 ‘sanctuaries’ is a cleverly-crafted art and architectural triumph; expect open-plan living spaces with 15-foot ceilings, private indoor-outdoor infinity pools, and just three walls - the open-air aspect allowing for unrivalled views of the soaring Pitons. Honeymooners receive a bottle of champagne on arrival, plus a special turndown service during their stay. The stay: What ticks the paradise box for idyllic views also delights with two sandy beaches, offshore coral reefs for snorkelling and scuba diving, fitness studio, and the all-day Jade Mountain Club for modern fusion cuisine. Sporty duos will enjoy kayaking, sailing, mountain biking, tennis and yoga classes, while spa lovers will love exotic beauty rituals at Kai en Ciel - meaning ‘house in heaven’. For wannabe gourmands, there’s also cookery lessons and plenty of chocolate-infused activities at the resort’s on-site chocolate laboratory. 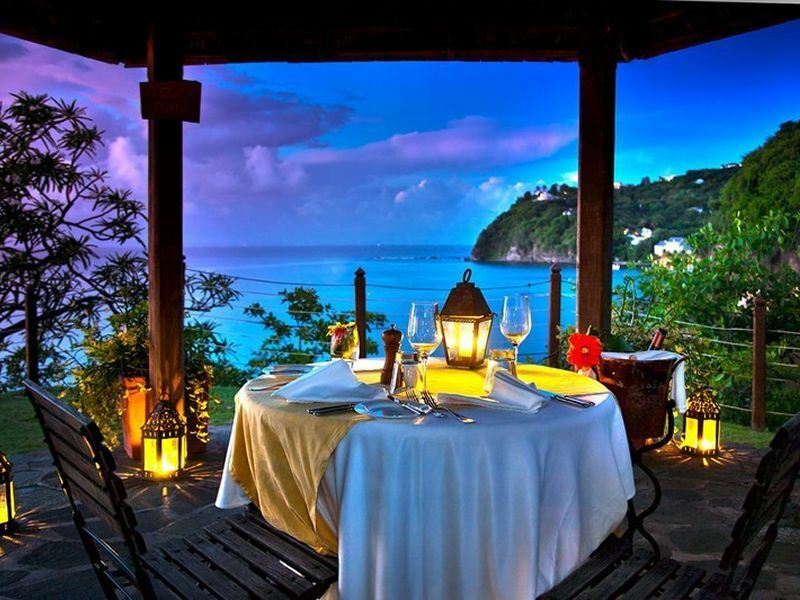 The setting: It’s ridiculously romantic at this self-styled Boutique Hotel for Couples - a 4-star All-Inclusive resort on Malabar Beach in St Lucia’s northwest. 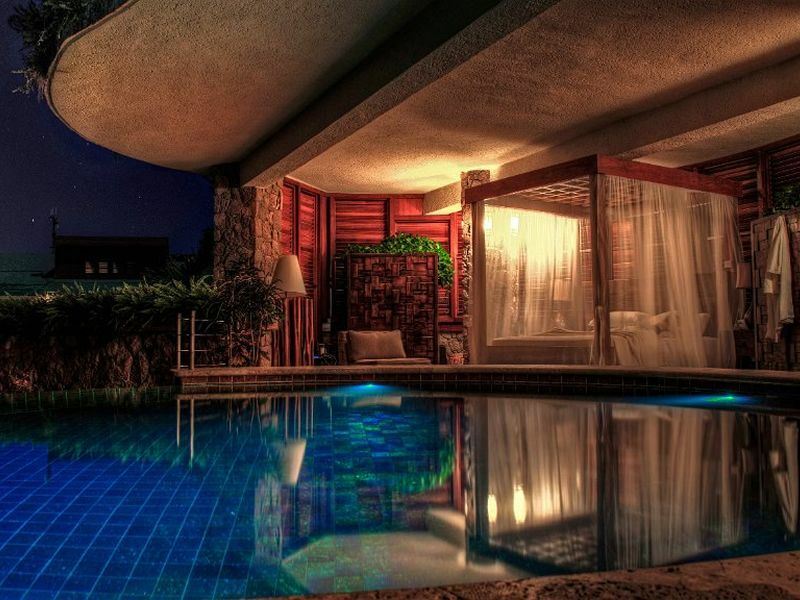 Family-run since 1966, everything’s exactly as it should be for romance-seekers: stylish, secluded, and very intimate. The sleep: With a complimentary upgrade guaranteed for honeymooners, accommodation is in gingerbread-style beachfront cottages, oceanfront rooms, or suites with split-level living areas. Some rooms have four-poster mahogany beds, bathrooms with stand-alone claw foot tubs, and terraces with hammocks. The stay: There’s a dedicated champagne bar, great selection of restaurants, watersports and land sports galore, fully-equipped gym with exercise classes, and beautiful gardens for mid-morning or afternoon walks. Equally noteworthy are the treatments at The Spa in the Water Garden, especially the open-air couples’ massages with essential oils, his-and-her relaxation treatments, and organic body wraps and scrubs. There’s also the option of private candlelit dinners-for-two where you can request a musician to serenade you with Caribbean lullabies.